Winter is a dull time for botany. The plants are hunkered down or dormant. Finding my goats in woods makes a walk interesting. 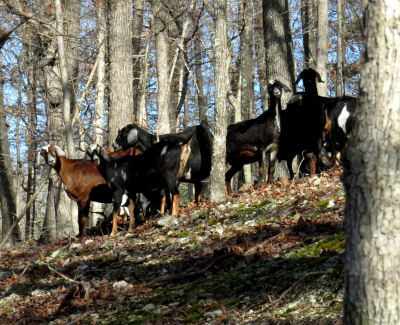 The strange thing about goats foraging in the woods is how they vanish. I wanted to check on the new kids. I knew where the goats had gone up into the woods. I followed the trail. And I found no goats. The trail winds across the hill, crosses a couple of ravines and continues back across another hill. Four deer bounded off as I approached the first ravine. No goats. The leaves were scuffed. There were hoof prints. I saw no goats in woods. The trail disappeared. I could look down into the big ravine. The herd probably went down and crossed to the south pasture hill. I turned around to start back. The bare, brown trees were silhouetted against the deep blue winter sky. Dry leaves scattered or crunched under foot. A few green plants hid under the leaves. A sedge with frost yellowed blade tips stuck up. I remember walking this trail when wildflowers scattered themselves across the hill. This is where I took the shooting star picture on the “My Ozark Home” cover. But no goats in woods rewarded my walk. I decided to take a side hike up to some big rocks and turned. Someone is coming, say the goats. They are on alert, ready to run. The herd stood there looking at me. On the way out I scoured the hills as I walked and saw no goats. Now they stood poised to bolt toward home. I called and started up the hill. They went back to foraging. Acorns are still thick on the ground here. Rose, Agate, Pamela and Spring came over for petting. Drucilla warned her kids to stay away from me. She was ignored. The herd moved on. I trailed behind amused at how goat in woods appear and disappear. This entry was posted in Ozark Hills and tagged Nubian goats, Ozark hills, winter walks on December 19, 2018 by [email protected].